Office Space - Welshpool, Powys. 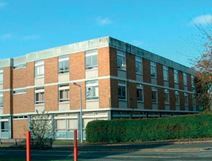 This modern property provides several floors of office space, all carpeted with central heating. Suites range in size from 500 to 3,000 sq ft. This is a great location with nearby Tescos and Morrisons, as well as a variety of banks and other amenities.